​Description: With more than 2 million downloads, The Johnson & Johnson Official 7 Minute Workout® App is the fast, simple, science-based way to work out anywhere, anytime. Designed by Chris Jordan, Director of Exercise Physiology at the Johnson & Johnson Human Performance Institute, the workout has helped over 2 million people get the most out of every minute. Bemben, D. A., Palmer, I. J., Abe, T., Sato, Y., & Bemben, M. G. (2007). Effects of a single bout of low intensity KAATSU resistance training on markers of bone turnover in young men. International Journal of KAATSU Training Research, 3(2), 21-26. Cotman, C. W., Berchtold, N. C., & Christie, L. A. (2007). Exercise builds brain health: key roles of growth factor cascades and inflammation. Trends in neurosciences, 30(9), 464-472. ​Chandrakumaran, H., Safdar, A., Sager, M., Nazli, A., & Akhtar, M. (2016). Regular Exercise Shapes Healthy Gut Microbiome. J Bacteriol Mycol Open Access, 3(3), 00063. ​DiFeo, G., & Shors, T. J. (2017). Mental and physical skill training increases neurogenesis via cell survival in the adolescent hippocampus. Brain Research, 1654, 95-101. Erickson, K. (2015). Effects of exercise on the hippocampus and memory in older adults. In Proceedings of The Physiological Society. The Physiological Society. Fritz, T., Huang, E. M., Murphy, G. C., & Zimmermann, T. (2014, April). Persuasive technology in the real world: a study of long-term use of activity sensing devices for fitness. In Proceedings of the SIGCHI Conference on Human Factors in Computing Systems (pp. 487-496). ACM. Halloway, S., Wilbur, J., Schoeny, M. E., & Arfanakis, K. (2017). Effects of Endurance-Focused Physical Activity Interventions on Brain Health: A Systematic Review. Biological Research For Nursing, 19(1), 53-64. Higgins, J. P. (2015). Smartphone Applications for Patients’ Health & Fitness.The American journal of medicine. Huang, T., Larsen, K. T., Ried‐Larsen, M., Møller, N. C., & Andersen, L. B. (2014). The effects of physical activity and exercise on brain‐derived neurotrophic factor in healthy humans: A review. Scandinavian journal of medicine & science in sports, 24(1), 1-10. Lupton, D. (2014). Apps as artefacts: towards a critical perspective on mobile health and medical apps. Societies, 4(4), 606-622. Lupton, D. (2014). Beyond techno-utopia: critical approaches to digital health technologies. Societies, 4(4), 706-711. Mariotti, A. (2015). The effects of chronic stress on health: new insights into the molecular mechanisms of brain-body communication. Future Science OA, (0), 1-6. Mattson, M. P. (2015). Lifelong brain health is a lifelong challenge: from evolutionary principles to empirical evidence. Ageing research reviews, 20, 37-45. McMorris, T., & Corbett, J. (2017). Neuobiological changes as an explanation of benefits of exercise. Norton, M. C., Clark, C. J., Tschanz, J. T., Hartin, P., Fauth, E. B., Gast, J. A., ... & Aguilar, S. (2015). The design and progress of a multidomain lifestyle intervention to improve brain health in middle-aged persons to reduce later Alzheimer's disease risk: The Gray Matters randomized trial. Alzheimer's & Dementia: Translational Research & Clinical Interventions, 1(1), 53-62. Rosano, C., Marsland, A. L., & Gianaros, P. J. (2014). Maintaining brain health by monitoring inflammatory processes: a mechanism to promote successful aging. Aging and disease, 3(1), 16-33. Sama, P. R., Eapen, Z. J., Weinfurt, K. P., Shah, B. R., & Schulman, K. A. (2014). An evaluation of mobile health application tools. JMIR mHealth and uHealth, 2(2). Snigdha, S., de Rivera, C., Milgram, N. W., & Cotman, C. W. (2014). 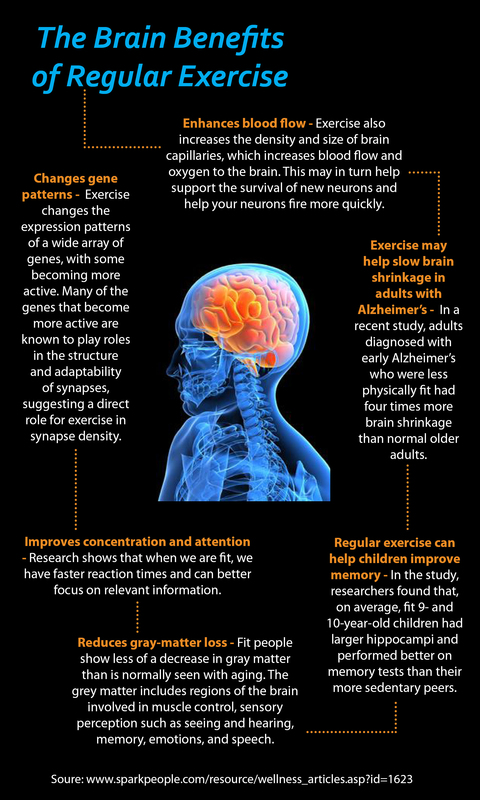 Exercise enhances memory consolidation in the aging brain. Frontiers in aging neuroscience, 6. Yau, S. Y., Li, A., Sun, X., Fontaine, C. J., Christie, B. R., & So, K. F. (2016). Potential Biomarkers for Physical Exercise-Induced Brain Health.